David Bizet, chef of La Galerie at Four Seasons Hotel George V Paris, helms another gastronomic spot in the dwelling. 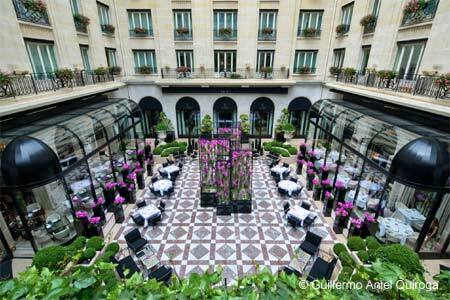 L’Orangerie opened in June 2016 and seats about 20 people in the historic courtyard of the hotel under a metallic framework. Expect sea bass carpaccio and poultry with asparagus and morilla mushrooms among other items. Lunch menu at €95. L'Orangerie, Four Seasons Hotel George V Paris 31, av. George V, 75008 Paris, 01 49 52 72 24.